see how you rank in the beer trivia category! This is a fundraiser for the TLBA to help with our scholarship program being awarded to North Warren graduating senior! We are asking for a $25 donation to join in on the fun. Promises to be a fun night for a good cause! Car Hop: Because of the weather, 11 cars entered the Car Hope last week and $60 was raised for the TLBA in the 50/50 raffle. Next Car Hop is scheduled for June 13th. ATV Ride to Benefit The Helpers Fund. 126 riders participated and $2,177 was made for the Helper’s Fund. Another ride is planned in July with proceeds going to the Tri-Lakes Business Alliance. Current TLBA checkbook balance is $1,004.32. Insurance is due as well as the pledged $500 NW Scholarship and these upcoming fundraisers are necessary for the TLBA to continue to function, so please support these worthwhile and fun events! 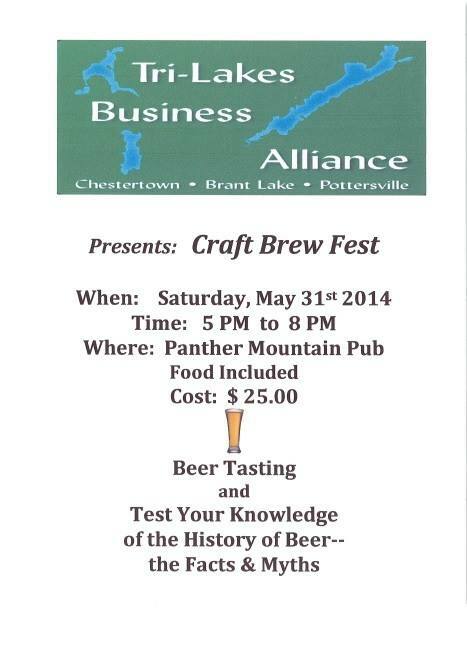 Craft BrewFest: Fund raiser on Saturday, May 31st, 5 PM to 8 PM at the Panther Mt. Inn. Come and enjoy a night of Beer tasting with numerous brewers on hand for brief presentations on the history of beer! Panther Mt. Inn will be donating food at their cost. Entrance fee is $25.00 and all proceeds will go to the Tri-Lakes Business Alliance. The Alliance is excited to share the formation of a new community organization. The group, the Adirondack Performing Arts Council (APAC), based in Chestertown, is dedicated to facilitating the experience of the performing arts within the Adirondack community and beyond. APAC’s home base will be the Carol Theater and events have been scheduled already for this summer. We all agree that this will be a great asset to our community. Check out their new website at adkpac.webs.com, and their facebook page, or on Instagram at @adkpac. Remember to “Like” them and “Share”. In addition, we recommend you read this article by Derick Borst on the Founding of APAC. There will be an Open House Fund Raiser on May 9th to correspond with the Car Hop so stop in and check it out! Funds are needed for this project for advertising & theater electric costs and committee will be sending a letter out to local businesses and individuals for donations to get them started. Performers will be paid by a portion of ticket sales. The Carol Theater building is also officially for sale, and anyone interested in more information should contact Cindy Mead at Gallo Realty. Chronicle: Brant Lake biz boom! The Chronicle covers local business growth in our community. Post by Glens Falls Chronicle.